The final results of the monthly fine art, jewellery and decorative art auction conducted by the Clarks Auction gallery from 12th to 14th July were quite exceptional. The event was a huge success and a significant highpoint in the firm’s history. The success of the July sale has been attributed by the auction house to their global marketing strategy coupled with the sale of supreme quality state property. A couple of Aborginal shields which went under the hammer grabbed the most attention in the grand auction. 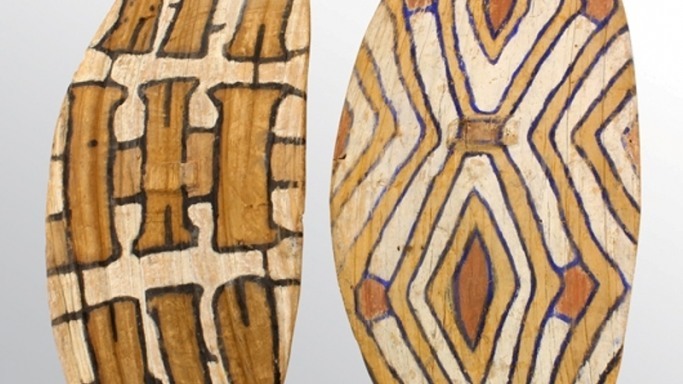 According to certain reports these particular shields featured in the auction list as part of the ethnographic collection sourced from a reputed San Francisco estate. The shields are made of fig tree wood and feature intricate carvings in the handles and carvings on the front panel. The shield has been measured at 34 ½ inches high and 14 ½ wide. There was a little problem regarding the age of the shields. Clars and another major auction house estimated that the shields originated around the post World War II era. However based on these projections, the initial estimated price was assigned in the range of nearly $400 to $600. However when the bidding eventually started at $400, stiff battle commenced between a couple of Australian competitors and the final price became a staggering $23,000 for a single shield. The same sequence of events continued for the second shield which surprisingly went for the same price. Both the shields were interestingly purchased by the same collector. Following the sale of the items the Vice President and Director of Furniture and Decorative Art for Clars Auction Gallery remarked that further research indicated that the shields were likely to be from the early 19th century era. How Much Would you Pay for Candy From Warren Buffett? Turner Masterpiece sells for a whopping $47 million!